Always The Truth. Always In Love. Is our only source of doctrine. With so much religious division in the world, our aim is to seek unity by simply going back to the Bible, and practicing Christianity the same way that the Apostles and first century Christians did. The church was established by Jesus (Matt 16:18), and not man. He said it would happen during the lifetime of those that were listening to His words back then (Mark 9:1), and that it would come with power (Luke 24:49). When the Apostles were gathered on the Day of Pentecost in Acts 2, the Holy Spirit revealed Himself to them in a powerful way. The church traces its roots back to this day alone. Christ came to seek and to save the lost. He gave us a simple plan by which we can be saved. In order to find true peace, unity, and to please God we simply accept the plan that He gave. 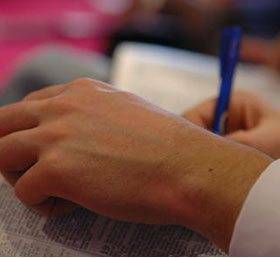 World Bible School offers free Bible study courses to interested souls around the world. The Itasca congregations helps to distribute and grade these courses. If you are interested in taking a course yourself, let us know! On a regular basis, members of the church make an effort to visit inmates in prison, and hold a worship service, and Bible study for those who are interested. Justin and Leah Hopkins are working under the elders at the Granbury Street church of Christ in Cleburne, TX to develop COMPASS curriculum. The goal is to give Bible class teachers the resources they need to point souls to Christ. Southwest School of Bible Studies has been training men and women to be preachers, elders, deacons, and Bible class teachers since 1978. Itasca has had the honor of supporting several students through the years, and we have seen them go on to do many great things in the service of the Lord. The Brown Trail School of Preaching is committed to training men and women to teach, uphold, and defend the truths o the Bible. Over the years we have been blessed to support many of the students of this school, and have seen them go on to do great things in the Lord's service. World Bible Institute is supported by the local church at Itasca. WBI has a single purpose of preparing God’s people with the Gospel of Christ to reach the whole world one graduate at a time!